Summary: The legislative agenda of the US Congress is currently considering offshore exploration for natural gas and petroleum within 9-20 miles of Florida Gulf coast, a region that overlaps with many sea turtles during the inter-nesting interval. The acoustic effects of undersea exploration and of vessel traffic are currently unknown for free-ranging sea turtles. This project will generate the first records of the acoustic environment of loggerhead sea turtles in inter-nesting habitats. Nesting females will be equipped with an acoustic bioprobe, a GPS satellite tag, and a GPS/GSM communication unit before they swim away for an inter-nesting interval. 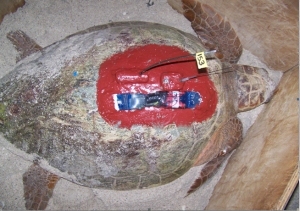 A recording tag will determine the acoustic environment experienced by turtles in the offshore environment. The GPS tag will give fine scale movement information to link with the bioacoustic data. When a turtle returns to nest, a GPS/GSM unit will allow precise location to ensure recovery of the archival data loggers. The data gleaned and refinement of methodology developed from a near shore study is a prerequisite before any studies are attempted on acoustic environments experienced by turtles in offshore realms. This project is a developmental step toward a more complete understanding of threats faced by sea turtles from boat traffic and opening the Florida near shore and offshore shelf to natural resource exploration.